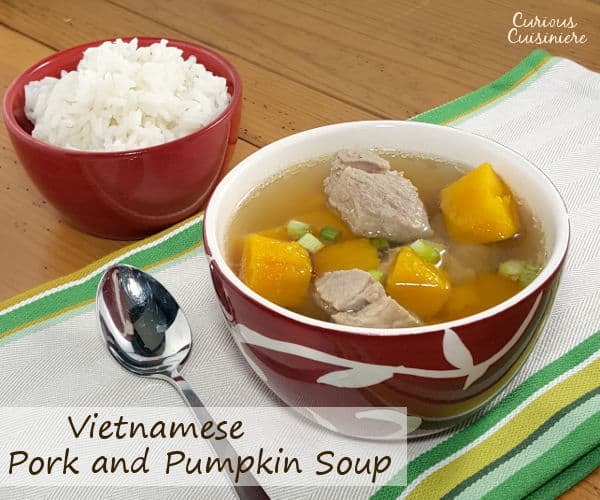 For such a simple soup, this recipe for Vietnamese Pumpkin Soup with Pork packs a whole lot of comforting fall favor. 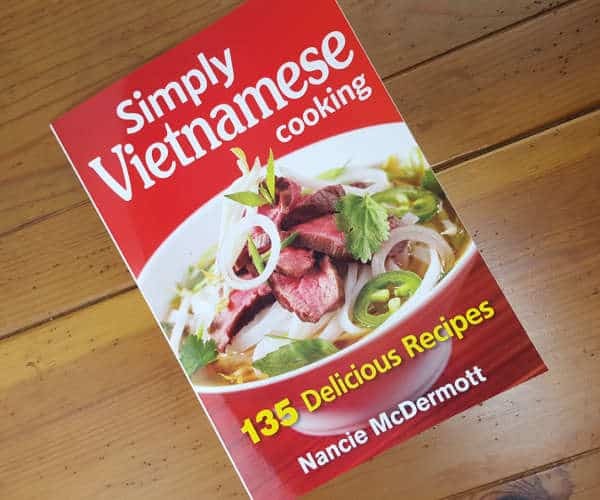 As we’ve been diving into Vietnamese cuisine, we had the opportunity to review “Simply Vietnamese Cooking” by Nancie McDermott. 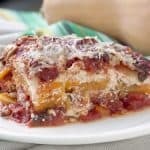 It is a jam-packed cookbook, covering everything from appetizers and snacks, to main dishes of every type, to sweets and drinks, and sauces. McDermott even ends her cookbook with a list of suggested menus, in case you would like to create your own full-fledged Vietnamese-style meals. We loved her explanation of the importance of contrast in Vietnamese cuisine: sour and salty, crunchy and creamy, sweet and spicy. Each meal is a beautiful balance, carefully thought out to make sure every element becomes a part of one, unified whole. This delicate approach to food was something we didn’t quite understand until we started diving into her recipes. Soup is a staple in Vietnamese cuisine. 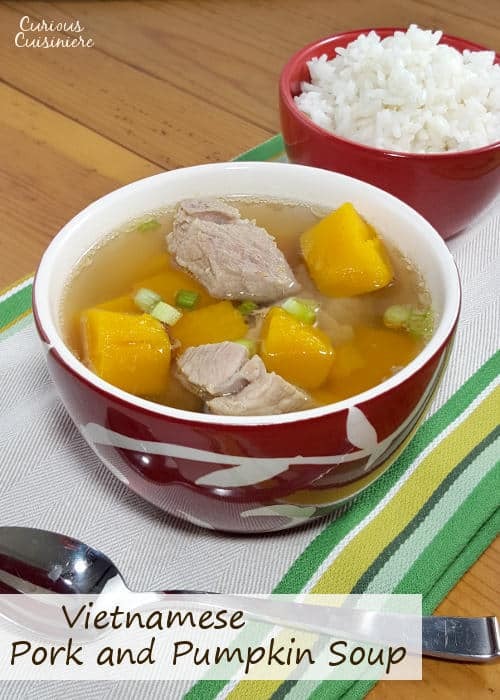 However, rather than being served on its own, soup is almost treated like a side dish, or better yet, a beverage, something light to be enjoyed throughout the meal and to cleanse the palate between bites of the main entree. 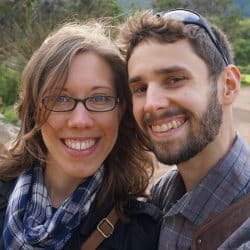 It is such a different way of looking at soup than we are used to as Westerners. 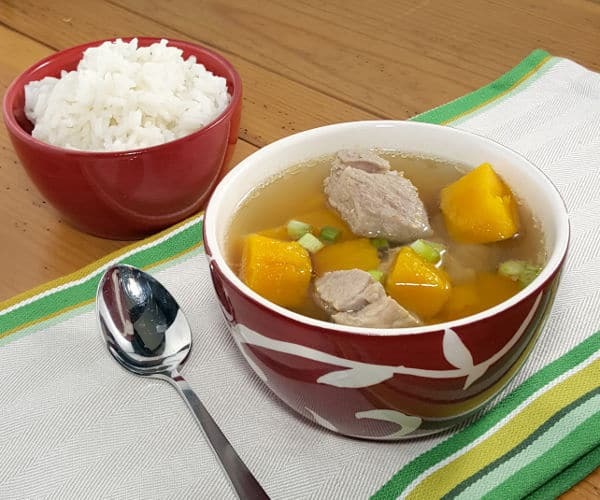 Her recipe for “Pork Rib Soup with Kabocha Pumpkin” sounded delicious and perfect for a fall day, with sweet kabocha pumpkin and meaty pork riblets. 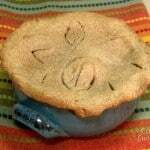 However, as we started putting the recipe together, we began to wonder. It was just too simple. Water, pork, squash, a little salt and pepper, a pinch of sugar, and a dash of fish sauce. What would this soup actually taste like? What we discovered was a dish uncluttered by complex techniques or over-seasoning. Each ingredient had been chosen for a purpose: the sweet squash gave the broth a smooth sweetness that was accented by the sugar, the pork ribs enlivened the soup with their richness, the fish sauce added the perfect depth of flavor, and the salt and pepper tied everything together into one wonderfully delicate dish. Green onions were the perfect garnish, adding just enough of a crunch and onion-y brightness. It was the most delicate food we have ever eaten. It was an exquisite soup. 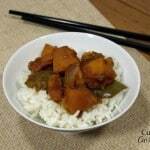 Kabocha pumpkin is also known as Japanese pumpkin or kabocha squash. We were lucky to have a local farmer who grew some last year that we were able to try, but we could’t find any this year. 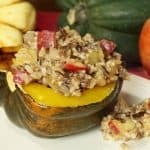 Kabocha pumpkin are sweeter than a traditional American pumpkin (even pie pumpkin), so we replaced the kabocha pumpkin with butternut squash (as McDermott recommends) to more closely mimic the flavor of Kabocha. Also, instead of the pork riblets she calls for, we used boneless, country style ribs and cut them into spoon-sized pieces. She suggests that if you can’t find riblets, you can also use pork chops. The author's initial recipe called for 1 tsp of salt, which we reduced to 1/2 tsp to better suit our tastes. Place the pork and water in a large saucepan and bring to a boil. Boil for 10-15 minutes, scooping off any foam that may rise to the surface. Add the diced pumpkin, salt, black pepper, and sugar. Simmer for an additional 20 minutes, or until the pumpkin is soft and the pork is tender. Remove the soup from the heat and add the fish sauce. 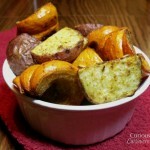 Serve hot or warm, topped with green onions. 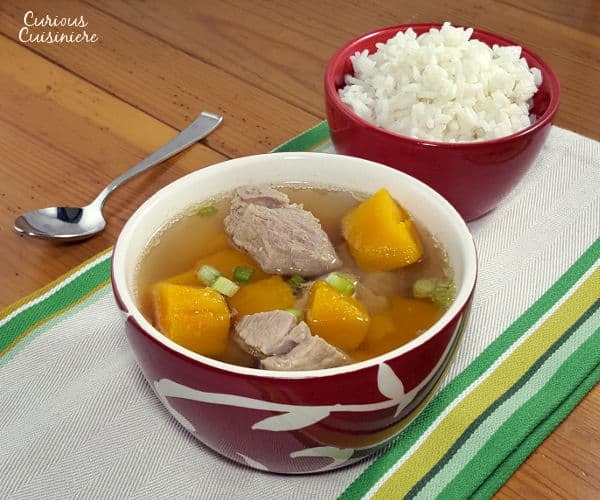 From the author: "This soup would traditionally be served as a part of a rice meal. 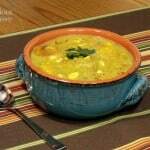 Be sure to serve it with rice or bread so you can savor the luscious golden broth." 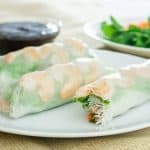 Disclosure: We received a copy of “Simply Vietnamese Cooking” for review. As always, we share what we enjoy and all opinions are our own. Thank you for this thoughtful, detailed and generous review of my new book, Simply Vietnamese cooking. 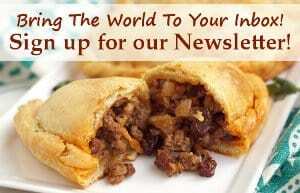 I particularly love this recipe and I’m so pleased you chose it. I know the feeling well, as I worked on the book and looked at how often Vietnamese dishes bring wonderful flavor from a simple combination of ingredients. We really enjoyed your book Nancie, and can’t wait to cook more recipes from it!